Yesterday the President of the Republic countersigned the decree law no. 113/2018 on security and immigration, strongly promoted by the Minister of the Interior Matteo Salvini. The decree, approved unanimously by the Council of Ministers on September 24th, is therefore in force and will be examined by the Chamber of Deputies and the Senate, with a term of 60 days to be converted into law. We have modified this article published on September 25th to include the new provisions provided for by the decree following its issuance by President Mattarella. The measures listed in the decree law will have significant consequences on the rights of those in need of protection, the reception system and the possibilities of integration of foreign nationals in Italy. The decree, amending the provisions of the Consolidated Act on Immigration (Legislative Decree no. 286/98), provides first of all for the abolition of humanitarian protection. This form of protection – additional to the recognition of refugee status and subsidiary protection – used to allow Police Headquarters (Questure) to issue a residence permit for humanitarian reasons to foreign citizens who showed “serious reasons, in particular of a humanitarian nature or resulting from constitutional or international obligations of Italy”. 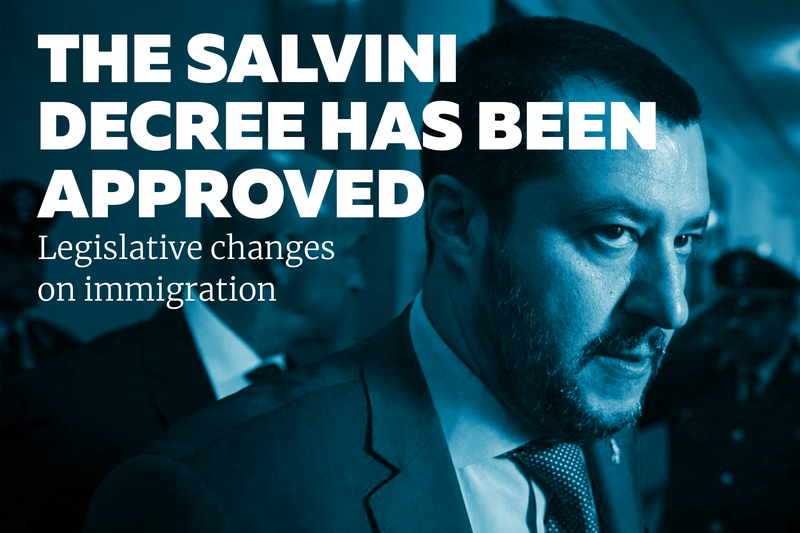 With the Salvini decree, this type of permit can no longer be granted – not even upon appeal. The wording “humanitarian reasons” therefore disappears from the Consolidated Act on Immigration, and with it the possibility of obtaining a residence permit except for “special cases”, which the legislative measure identifies with some specific circumstances. The decree introduces a special residence permit for those in need of medical care, for victims of domestic violence or serious labour exploitation, for those coming from a country that is in a temporary situation of disaster and for those who have performed acts of high civil value. The decree produces significant consequences not only for those who currently benefit from humanitarian protection – whose situation will become uncertain – but also for the protection system for asylum seekers and refugees (SPRAR system), which turns into a system of protection reserved solely for beneficiaries of international protection and foreign unaccompanied minors. The previous legislation provided that refugee status could be denied or revoked when the foreigner represented a danger to the public order and public security because of a final conviction for crimes such as murder and sexual harassment. With the Salvini decree, further offences cause the denial or withdrawal of international protection, ranging from harassment or threats to a public official, to aggravated personal injuries, to various offences of theft. New provisions concerning asylum applications are provided for as well. According to the decree, in the event that the asylum seeker is subjected to criminal proceedings or convicted – even with a non-final ruling – for one of the offenses for which refugee status is refused, the police commissioner (questore) is obliged to promptly inform the relevant Territorial Commission. The latter will then hear the asylum seeker and at the same time take a decision on the case. If the asylum application is rejected, the foreigner will be obliged to leave the country, even while the appeal against the decision of the Commission is pending. Before the Salvini decree came into force, the Consolidated Act on Immigration provided that irregular foreigners awaiting repatriation could be detained at Repatriation Centres (Centri di permanenza per il rimpatrio, CPRs) for a maximum of 90 days. This time limit was set in 2014, when the legislator, for the first time since administrative detention for foreigners was introduced in the Italian legal system, intervened not to increase, but to reduce the maximum limit of detention in the then Centres for Identification and Expulsion (Centri di identificazione ed espulsione, CIEs). The previous time limit, set at a maximum of 18 months, did not in fact prove useful in increasing the number of returns, which become increasingly difficult with the extension of the detention period. The extension of the time spent in administrative detention centres – an expensive measure of little use to the efficiency of the return system – also appeared to be a mere punitive tool for irregular migrants. The Salvini decree, instead, doubles the 90-day time limit, bringing it up to a maximum of 180 days. The legislative measure also provides that foreigners may be detained in places other than Repatriation Centres in appropriate facilities available to the public security authority. Such measures, however, can only be adopted this does not entail additional costs for the administration. The decree also introduces the possibility of detaining asylum seekers in hotspots for 30 days in order to ascertain their identity and citizenship. If this is not possible, asylum seekers may also be detained in Repatriation Centres for up to 180 days. However, measures of this magnitude violate national and international rules by penalising the illegal entry and stay of asylum seekers without travel documents – as is often the case for those fleeing persecution or countries at war. The Salvini decree also modifies the legislative framework concerning foreigners who have obtained Italian citizenship. The latter will in fact be withdrawn if the foreigner poses a threat to national security because he or she has been convicted with a final ruling of crimes committed for terrorism or subversion purposes. The withdrawal of the citizenship will be ordered within three years after the judgement has become final. This measure is to be adopted through a decree of the President of the Republic on the proposal of the Minister of the Interior. The decree is now going to be examined by the Chamber of Deputies and the Senate, with a term of 60 days to be converted into law.